Desc: Black Hills Gold Sterling Silver two tone horseshoe necklace. The chain is light rope link style and has a spring ring clasp. The pendant is Black Hills Gold and Sterling Silver, one horseshoe made of each metal. The Sterling Silver horseshoe and the bale are bright polish finish. 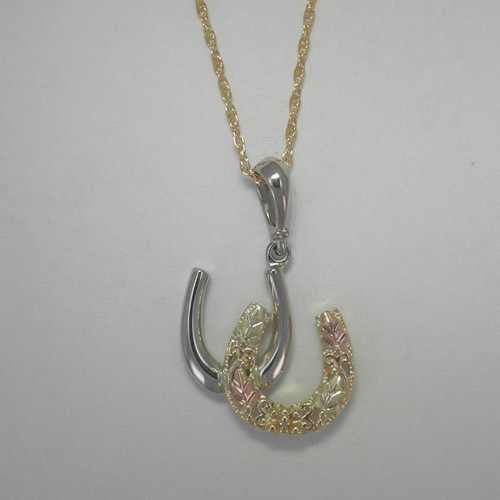 The gold horseshoe is fashioned from rose and green gold leaves and grape clusters. The horseshoes are offset and overlap. The necklace has a bright polish and textured finishes and is made in the United States of America.